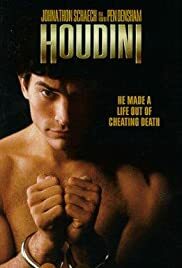 In this 1998 tv biography of Houdini, Johnathon Schaech passionately, and incidentally attractively, stars in the title role. "Houdini" is the perspective of his life by his wife, Bessie Houdini, 10 years after his death during a publicized "last seance," through which she hopes to communicate with him. It is an emotional, love-stricken wife's memories of her obsessed, but loving, late husband. As such, this movie is not a detailed documentary of his life, but an emotionally, romantic reminiscing of the life of the man. As a love-story, Houdini has effectively worked its magic. It is filled with much admiration, sentiment, and emotional angst as expected from a loving, but emotionally-conflicted widow at the time of her husband's death. Bessie's portrayal seems focused on her mounting discomfort and tension over the course of decades of their marriage due to her late husband's obsessesive life's work to entertain with death-defying feats and his driven attempts to unmask spiritual charlatans as he attempts to communicate with his late mother. "Houdini" does little to educate us on the many details and exploits of the late master magician, as I had originally expected. I realized, in hindsight, that this interpretation of Houdini's life makes no attempt to provide a significant and detailed retelling of his life's obsessions, but provides just enough information to provide a background to the relationships with the significant women in his life, primarily with his wife and secondly with his mother. Compared to two other Houdini biographies I remembered from watching on tv many years ago (namely, 1953 or 1957 "Houdini" starring Tony Curtis and 1976 "The Great Houdini" starring Paul Michael Glaser) I find it a more passionate portrayal of the great illusionist and escape artist and offers greater emotional depths that the other two films did not provide; in those portrayals, they attempt to pack in as much information as possible, but unfortunately, some erroneous info. as well. "Houdini" fortunately debunks a popular myth that he did died on stage immediately after failing to escape during an act; in reality, he had died days after his last performance in a hospital, on Halloween of 1926. Pen Densham, director, writer, & executive producer, turned out an interesting and entertaining & romantic biography. Johnathon Schaech gives a newly alluring and passionate dimension to Houdini, and possibly the most multi-dimensional role, as well, he has yet portrayed. Stacy Edwards sympathetically portrays the worriedly tormented, alcoholic, at times shrewish, but loving wife. Other supporting cast members, Paul Sorvino as Blackburn (radio show host), Rhea Perlman as Esther (spiritualist), George Segal as Martin Beck (Houdini's manager), Mark Ruffalo as Theo (Houdini's brother), and Grace Zabriskie as Cecelia Weiss (Houdini's, a.k.a. Erich Weiss', mother) turned in from suitable to quite good performances, particularly for a tv film.